PetPal Manager's Pet Manager is the core of the application. It allows you to keep a record of all the pets that come in and get adopted out of your rescue and all the information that pertains to the pet while it's with you. To start you complete an intake form that takes all your pets basic information (name, pet type, age, gender, breed/species, intake type, intake date, etc. Description: Used for the pet's uploads to Adopt-a-pet.com and Petfinder and various printed materials created by PetPal Manager, this area allows you to write a public friendly description of the pet. Pet Health: This section allows you to add various medical records for the pet. Medical Records: Spay/Neuter, nail trimming, detail cleaning, x-rays, surgery. Each record includes where the procedure was performed, who performed it, who in your rescue requested/authorized it, the cost (which is added to your expenses), whether you paid at the time or deferred it, and notes regarding the procedure. Shot Records: When the shot was given, when the next is due, what type, where the shot was administered, who administered the shot, who requested/authorized it, the cost (which is added to your expenses), the cost, and whether it was paid then or deferred. Temperament Testing: What type of test was given (Good with dogs, good with cats, good with kids, food aggressive, toy/cage aggressive, and custom tests you administer per your pet, result of the test, when the test was given, who gave the test, and notes. Medications: What kind of medication, what it is a treatment for, who it is administered, who long the pet must be on it, how often it must be given, who administered it, who requested/authorized it, the cost, if it was paid for or deferred, and notes. Special Needs: Record any special needs of the pet, if the condition is treatable, if so, how, and notes. Training/Rehab: Keep a record of any training or rehabilitation you do with the pet. Record what type, who worked with the pet, and when the record was recorded. Incident Reports: Pulling records from the Incident Module for that particular pet, keep a record of any incidents you have with a particular pet while in the adoption process. 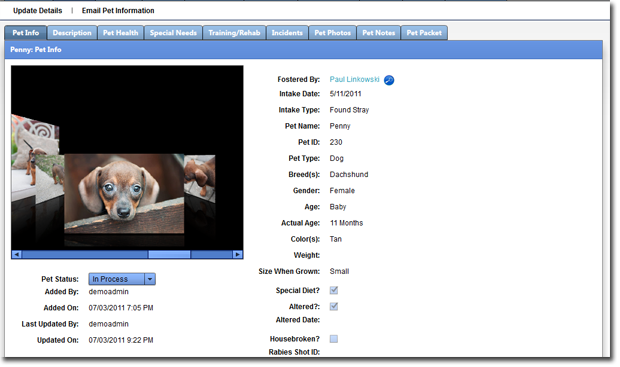 Pet Video: Use PetPal Manager to upload videos of your pet which is uploaded to either our YouTube account or your own and exported with your pet's information to Adopt-a-pet.com and Petfinder. Pet Notes: Keep private rescue notes of your pet while they are in your care. All notes are shared amongst the other users in your rescue and can include any information you wish to share about the pet. Pet Packet: This generator creates a PDF of all your pet's information (Info, Medical, Photos, Special Needs, etc) which you can use as an adoption packet for adopters or, removing the cover, allows you to have a printable 'paper' copy of each pet's record. The cover includes your rescue or shelter logo (if uploaded), a picture of the pet (if uploaded) and their name, age, gender, and breed/species. When generating, you have the option of including a cover, include the pet's basic information, medical records, and photos. 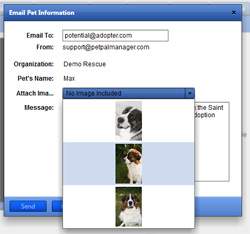 Another feature of the pet's detail page is the ability to email a prospective adopter. The email includes the pet's information and you can choose 1 image to attach to the email (which you can select the best one). All you have to fill out is the prospective (or anyones) email address and you can include a custom note.